Picks up where the mess leaves off. 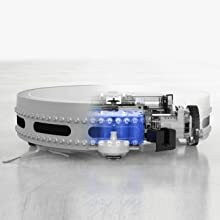 From specs to style, bObi Pet is the strongest model to come from Canadian robotic vacuum manufacturer, bObsweep. 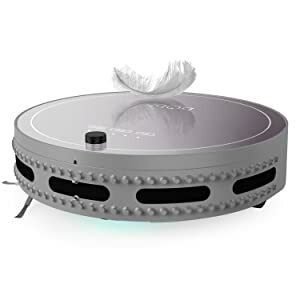 bObi Pet is the culmination of a long line of automated cleaners that vacuum, sweep, mop, disinfect, and filter all at the same time. bObi Pet’s supercharged motor and long-lasting battery complement her fierce color options and signature, silky-textured casing. 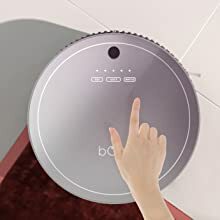 Powerhouse technology meets innovative design in bObi Pet’s intelligent, compact cleaning system. 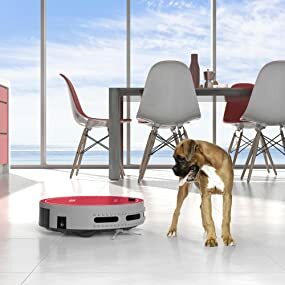 We at bObsweep want to ensure that your bObi Pet remains among the best choices you’ve ever made for yourself and your home. 2-year coverage on all parts and 60-day money back guarantee! Cleanup is the one part of pet ownership we don’t speak fondly of. 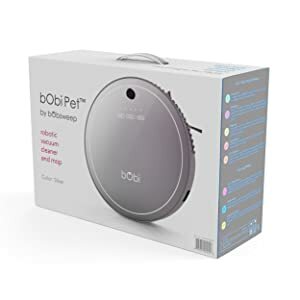 Unleash bObi Pet in your home and her 5-in-1 cleaning powers quickly turn mess to magic, something really worth bragging about. 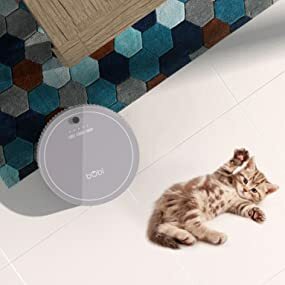 Fur and dirt don’t hold any ground against bObi’s stronger suction, motor upgrades, increased battery life, and luxuriously svelte TouchMe texture. From the inside out and beyond, bObi Pet is the best of the pedigree. GO! – bObi’s go-to setting activates advanced movement algorithms to cover the most ground. Waffle – Be ready for accidental spills and target dense dirt areas with Waffle. Manually direct bObi’s movement, set her cleaning schedule, and switch between cleaning modes all on her wireless controller. Activate all of bObi Pet’s cleaning power with just three, illuminated buttons: Go!, Juice, and Waffle. When bObi Pet’s battery reaches 15%, she automatically steers to her charging station to ‘juice up’. 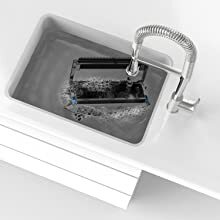 bObi’s fully submergible, waterproof dustbin thoroughly removes lingering dirt with just a single rinse. 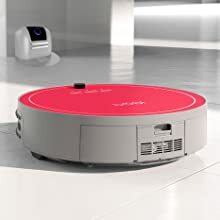 Simultaneous sweeping, vacuuming, mopping, UV sterilization, and HEPA filtration make bObi efficient and your floors magnificent. 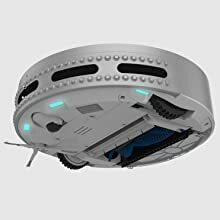 bObi’s X-AMPlified battery runs on average for more than 1 hour and 30 minutes before recharging, and is covered by an unrivaled 2-year warranty. 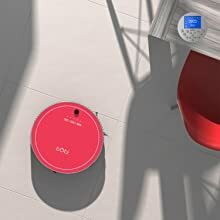 bObi swiftly avoids stairs, edges, furniture, and other obstacles in her path with her highly-responsive infrared edge sensors and 80 touch sensors. 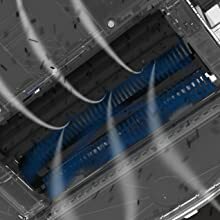 bObi’s parallel bristle and rubber brushes double her sweeping power, while her side brush extends her cleaning path to clear corners and other hard-to-reach places. Create smart boundaries with bObi blOck. This new accessory fabricates an invisible, linear block to section off any part of the room you choose. 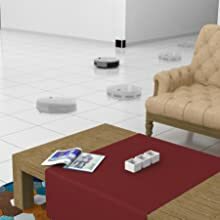 Place blOck along the area you want bObi to avoid, and she will clean around it as if you drew a digital partition across the room. 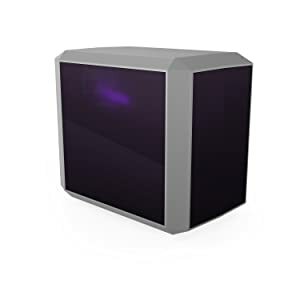 blOck is included with every bObi Pet but available separately from the bObi Classic package. Feel it and you’ll never forget it: smooth, satiny, and immersive. The luxurious TouchMe texture covers bObi Pet’s surface in a silky sensation unlike any other. Crafted from an original silicone formula, this striking vision of luxury is one only your fingertips can fully grasp. bObi Pet, Charging Station & Adapter, Remote Control , blOck, Mop Attachment & Microfiber Mopping Cloths, XAMPlified Battery, Mainbrushes & Sidebrushes, Spare Set of HEPA Filters, Spare Mainbrush Holders, Maintenance & Syncing Tools, Blindfold Stickers, Owner’s Manual, Quick Start Guide, and Warranty Card.